Autoblog has a somewhat sad post (depending on which side of the coin you’re on) regarding Honda hitting the panic button and pulling negative comments around the launch of their controversially designed Crosstourer. In addition to pulling negative comments, a Honda employee took to defending the brand without formally announcing his association with the company. This lead to an instant sniffing out of poor Eddie Okubo as a shill. 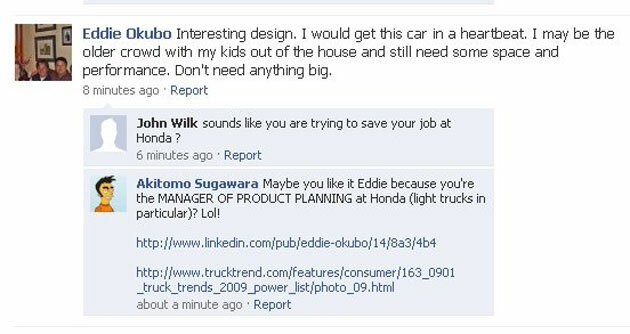 Eddie Okubo is a manager in Honda Product Planning. His post was removed for two reasons: 1) He did not first state that he is a Honda employee and that his posting is his personal — not Honda’s — opinion. 2) He is not a spokesperson for Honda. Look I get it. By not introducing himself as an employee, he could’ve gotten Honda in a heap of trouble. At the same time, by pulling negative comments around the Crosstouer on their Facebook page, started the fire that may have died down. What Honda failed to do was listen. The blogosphere was abuzz about the less than desirable physical attributes of the Crosstourer. In fact, Tuesday, when the car was revealed, the comments almost instantly turned negatively with comparisons to everything from old soviet style transportation to the Pontiac Aztek. While the Crosstourer may have passed the focus group test in a controlled setting where structured questions dominate the conversation between brand and consumer, social media becomes a free thought free-for-all and the immediate reaction to this vehicle wasn’t too great. Coincidentally, GM had faced a similar issue when it announced that it would put a badge engineered small SUV into market under the Buick brand. After a few photos were revealed however, the negative response caused GM to pull the idea and decide against producing the vehicle. Anyway in conclusion, Honda has a wonderful fan base. They typically choose function over fashion and remain loyal to the brand through every right of passage, graduating from Civic to Accord and never wavering. This has been a difficult year for them however, as their hybrid, the Insight, failed to move the needle while taking a considerable amount of criticism from magazines such as Consumer Reports. The Crosstourer may be a great performer, but by ignoring the very customers who may be in dealerships, they’re already at a distinct disadvantage.